Cadbury Creme Eggs used to come only once a year. 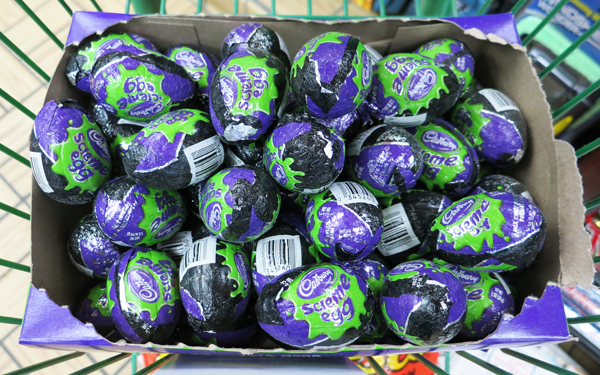 Now there are these "Screme Eggs" out for Halloween. I guess that's good. There's ectoplasmic green inside. They messed up the name. What better describes TrickerTreaters scroungey behavior better than "Beg-Egg"?! I would say that I'm happy the best part of Easter just became the best part of Halloween, except that of the these two holidays solely meant to celebrate (in my opinion) the pure enjoyment of binging on candy, I can also participate in costume-wearing on Halloween. And that probably beats another occasion for Cadbury eggs.